CANBERRA, Australia, August 2, 2013 (ENS) – Australia will start construction in January on the largest solar power station in the Southern Hemisphere, which will meet the electricity needs of over 50,000 average Australian homes. Approval came on July 29 when financial agreement was reached among the Commonwealth and New South Wales governments and AGL Energy Ltd, Australia’s largest private owner, operator and developer of renewable generation assets. Australian Minister for Climate Change Mark Butler says the solar project will be built across two sites in western New South Wales and will cover a total combined area four times the size of the central business district in Sydney, Australia’s largest city. “This project is 15 times larger than any other solar power station in Australia and represents a big step forward towards making solar a bigger part of Australia’s energy mix,” he said. Labor Prime Minister Kevin Rudd, who was returned to office for a second time on June 27 after defeating his own party’s leader, Julia Gillard, is a supporter of renewable energy. He is seeking approval from the Governor General for a general election on September 7. “The Rudd Government is committed to transitioning Australia to a clean energy future and this combined 155 megawatt solar project helps make renewable energy cost competitive for more Australians,” said Climate Minister Butler. Minister for Resources and Energy Gary Gray said this is a major milestone for AGL and the government and will help boost investor confidence in utility-scale solar power. “Reaching financial close and progressing to construction is a major achievement paving the way for future investment and meaning that, in a short time, an additional 50,000 homes across New South Wales will be powered by clean energy each year,” Gray said. AGL Energy, together with U.S. solar developer First Solar, will construct a solar power plant near Nyngan (102MW) in central New South Wales and another near Broken Hill (53MW). Construction of the Nyngan project is expected to begin in January 2014, with completion scheduled for mid-2015. Construction of the Broken Hill project will start in July 2014 and is scheduled for completion around November 2015. Together, the projects will create 450 local jobs during construction. First Solar will supply the projects with its advanced thin-film photovoltaic modules and provide engineering, procurement and construction services as well as maintenance support for five years once the solar farms are operational. The work will be done by First Solar (Australia) Pty Ltd, a wholly owned subsidiary of First Solar, Inc, headquartered in sunny Arizona. Butler said this strategic investment was part of the Labor Government’s broader efforts to stimulate investment in renewable energy in Australia. 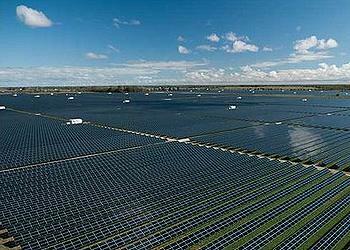 In addition to the A$166.7 million the Federal Government is investing through the Australian Renewable Energy Agency, it is also providing A$40.7 million under the Education Investment Fund to assist the University of Queensland and the University of New South Wales conduct related solar power research. “Labor’s $3 billion Australian Renewable Energy Agency and $10 billion Clean Energy Finance Corporation are designed to drive significant renewable energy investment and this is a great example of a flagship solar project for Australia,” Butler said. “Combined with the Renewable Energy Target of at least 20 percent by 2020 and the establishment of the Emissions Trading Scheme, we are already seeing the results of Labor’s reforms,” he said. Since 2007 when Rudd was first elected head of a Labor Government, Australia’s wind capacity has tripled and Labor has supported the installation of more than one million solar panels under the Rudd and Gillard governments. “Carbon pollution in the National Electricity Market is down by around seven percent in the last year and renewable energy generation like wind and solar power is up by 25 percent in the same period,” Butler said. The New South Wales Government will also invest A$64.9 million in the project and recently approved the Development Applications for the Nyngan and Broken Hill solar plants. New South Wales Energy Minister Chris Hartcher joined ministers Butler and Gray in announcing the funding agreement between AGL and the Commonwealth and NSW Governments. “This project will drive regional investment and deliver economic benefits to Broken Hill and Nyngan, with a significant amount of capital expenditure to be spent in both areas,” Hartcher said. The solar generating stations will help New South Wales to meet its target of producing 20 percent renewable energy by 2020.